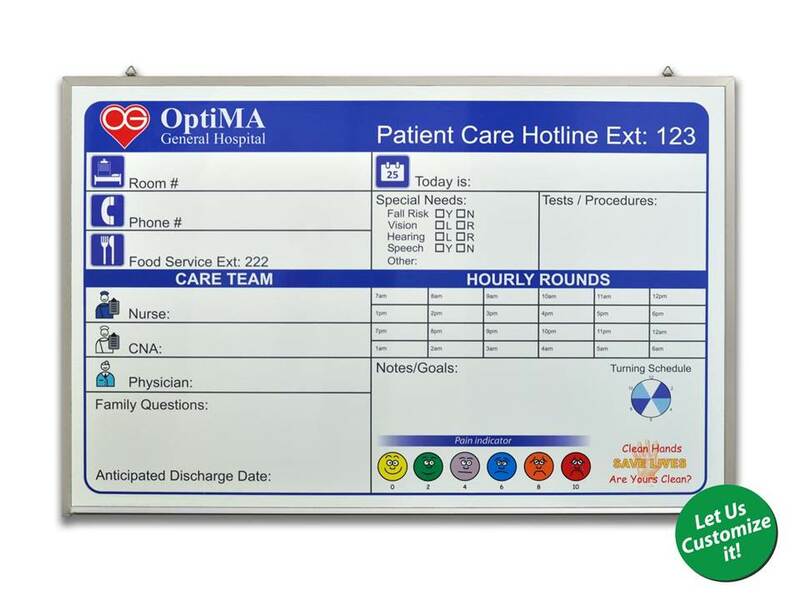 Economy non-magnetic custom printed hospital boards from OptiMA are made exactly to your specifications with one of the most impressive dry erase writing surfaces that you will ever use or erase. 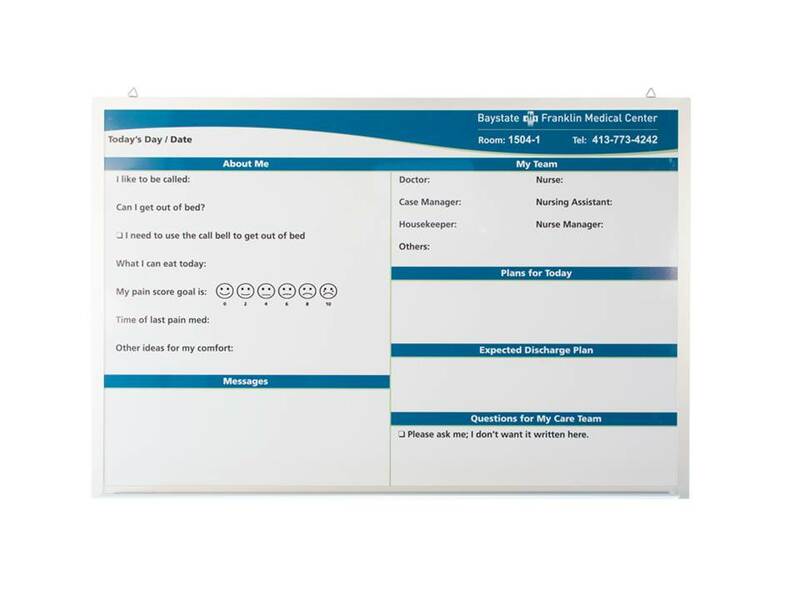 These printed hospital boards have a non-magnetic dry erase writing surface which means that you won't be able to use any type of magnets or magnetic accessories but there are so many instances where you wouldn't be using any magnets anyway so why pay the extra cost of a magnetic whiteboard. 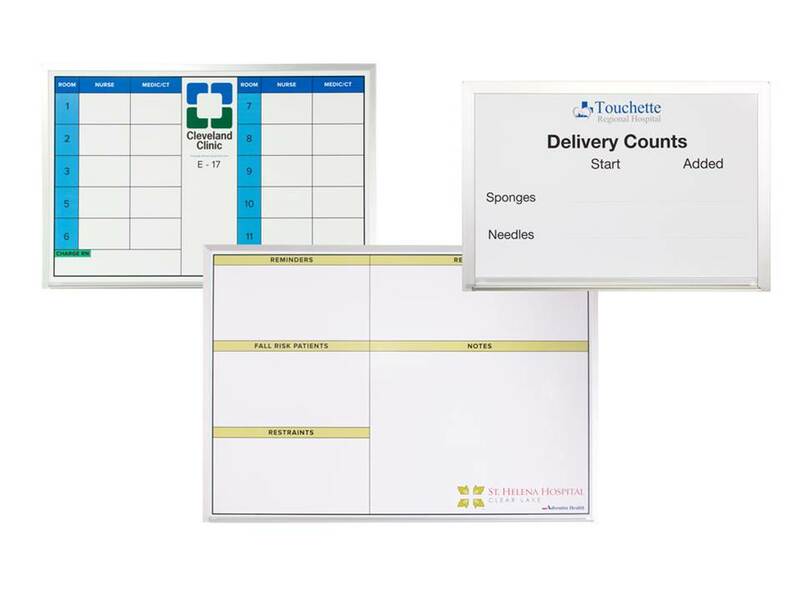 Magnetic whiteboards are great if you have the same information that gets repeated over and over again and it gets moved from one place to another on your board like maybe a surgery scheduling board but if the information you're writing is always or at least for the most part unique then a magnetic board is really of no use to you. There are other circumstances where maybe you wouldn't want magnets or anything else left on the board that could be removed or misplaced like possibly in an operating room. OptiMA custom printed non-magnetic hospital boards have the exact same, high quality dry erase writing surface as our magnetic version of the same board and you can clean these boards with Isopropyl Alcohol to disinfect them and it won't hurt the writing surface whatsoever. In fact independent test lab results show that our boards washed down with a 70% alcohol solution killed over 99.99% of staphylococcus and E. coli bacteria. 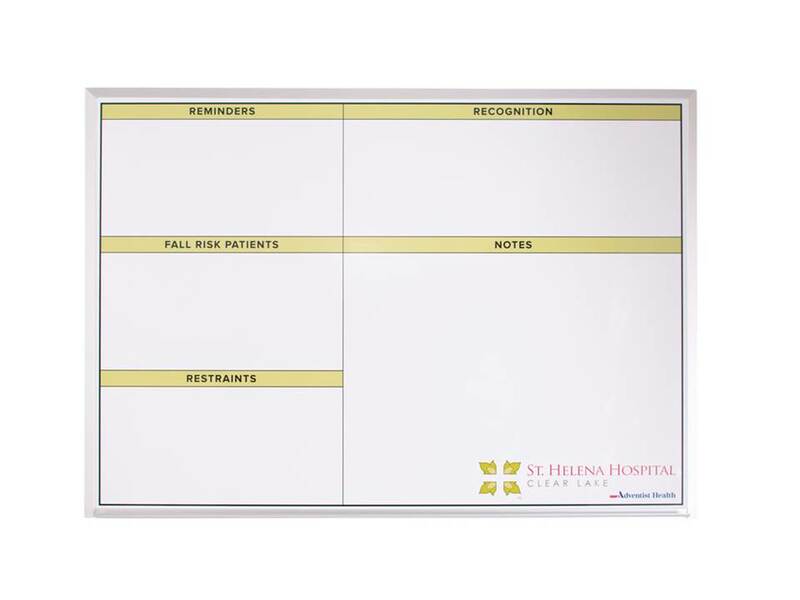 Your new non-magnetic hospital boards will erase clean, without ghosting for years to come with proper care and very little maintenance. 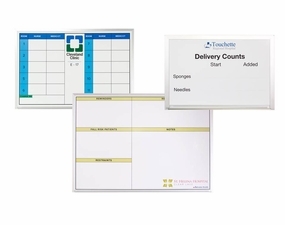 Our staff can assist you in creating the exact custom printed board or boards that will suit your exact needs and we promise to make it easy and as painless as possible. Painless, see you’ve got us talking like one of the staff already! *Ships UPS - Dimensional Weights Apply. May be more economical to ship by Truck with larger volume orders. **No Tray Units also available through customer service. Add suffix of -NT to product codes above. Non-magnetic dry erase writing surface. 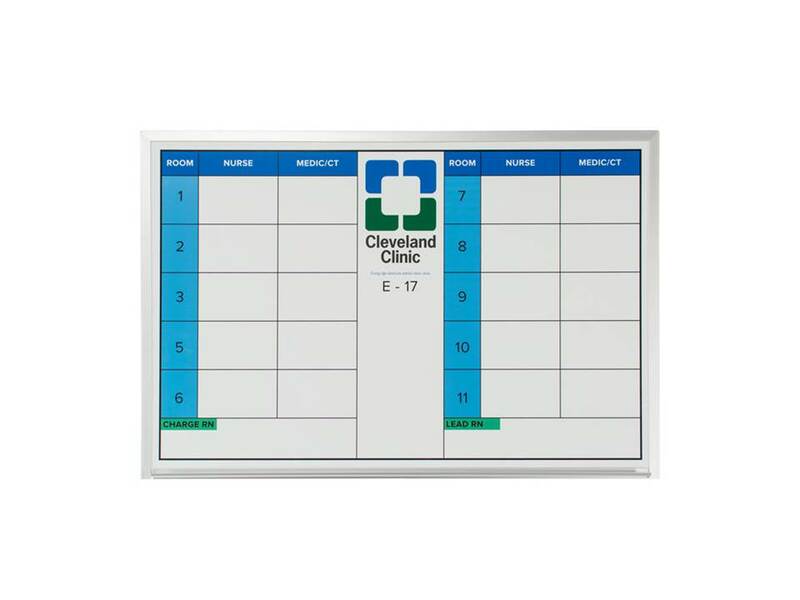 Choose if board will have marker tray (default) or not. You approve the proof before we create any boards. Five-year warranty on the erase-ability of all Opti-Print boards. Lead-time for proofs: 2-3 business days. Lead time for board(s) to ship: 3-5* working days after accepted proof. 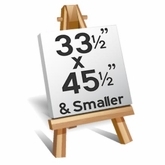 Custom printed graphic boards are not returnable. Custom sizes are available. Please contact customer service for a quote. Low cost one time artwork fee. We keep your artwork on file for a period of one year or the date of your last order.